Durga Puja is the most important Hindu festival held for 10 long days all over India celebrated with immense enthusiasm. It falls in the month of September or October. The festival is also known as Durgotsav or Sharadotsav in Bengal and in the Western and Southern sub-continents of India called as Navratri. It is majorly celebrated as Durga puja in the Eastern and North-eastern regions. The festival holds major significance in Bengal, Assam, Orissa and other regions nearby. Durga Puja basically commemorates the victory of Goddess Durga over the buffalo-demon king Mahishasura; celebrating the triumph of good over the evil. The festival is also seen celebrated in Bangladesh and Nepal as ‘Dashain’. The first day of Durga Puja begins with Mahalaya, which falls on Shashthi (sixth day of the festival). The localities or temples are decorated with huge pandals in which idols of Goddess Durga are worshipped by the devotees. The last day (Dashami) of Navratri/Durga Puja is celebrated as Dussehra in many regions of the country. On this day, Visarjan process is performed in which the idols of Goddess Durga are immersed in water bodies nearby the localities. In Sanskrit, Durga means ‘She who is inexplicable’. Goddess Durga is a form of Shakti and people worship her for her courteousness. The Hindus believe her to be the Mother of Universe as she had a limitless power and symbolizes female dynamism. Goddess Durga is known and worshipped by many names such as Lakshmi, Saraswati, Kali, Ambika, Parvati, etc. She was a divine spouse of Lord Shiva, in the form of Parvati. They both had two sons; Ganesha and Kartikeya, and a daughter named Jyoti. Durga Shailputri, Bramhacharini, Chandraghanta, Skanda Mata, Katyayani, Kaalratri and Maha Gauri were the different forms of Goddess Durga. In all, Goddess Durga had taken nine forms which are worshipped by the people on nine different days of Durga Puja or Navratri. As the daughter of Himalaya Mountains, Goddess Durga took the first form among the nine as ‘Durga Shailputri’. She was the daughter of ‘Daksha’ in her previous birth and her name was Sati-Bhavani, who was Lord Shiva’s divine wife. Daksha had arranged a Yagna for which Lord Shiva and Sati were not invited. But in spite of being uninvited and as Sati was stubborn, she reached at the Yagna due to which Daksha insulted Lord Shiva. Seeing this, Sati got angry as she could not tolerate her husband’s insult and thus burnt herself in the fire of Yagna. Then she re-incarnated as the daughter of Himalaya in the name of Parvati-Hemvati and married Lord Shiva. Bramhacharini was the second form of Goddess Durga. ‘Branha’ means penance (tapa). This Goddess’s idol is full of beauty. The right hand of the idol holds a rosary (a string of beads used in counting prayers) and a Kamandal in the left hand. In her previous birth, she was the daughter of Himvan and so was called Parvati Hemawati. So after hearing these words from Naradji, Parvati told her mother, Menaka that she would marry no one else but only Shambhu and went to observe a penance. Sincethen her name became Bramhacharini. Chandraghanta was the third form of Goddess Durga. She beared this name because she had a semi-circular moon on her forehead and held bells in her hand. As she wore a moon, even her idol has a semi-circular moon over her forehead and looked too charmful in Golden color. The idol has three eyes and ten hands holding ten different types of weapons. She is seated on a lion and ready to go for war. All the demons are frightened by the terrible sounds made by the bells in the hands of Chandraghanta. The Durga Puja festival starts with Mahalaya that falls on sixth day of the 10 days festival. A lot of people offer prayers to Goddess Durga and perform various pujas and rituals in order to worship her. The pujas and rituals for these main days are very long. 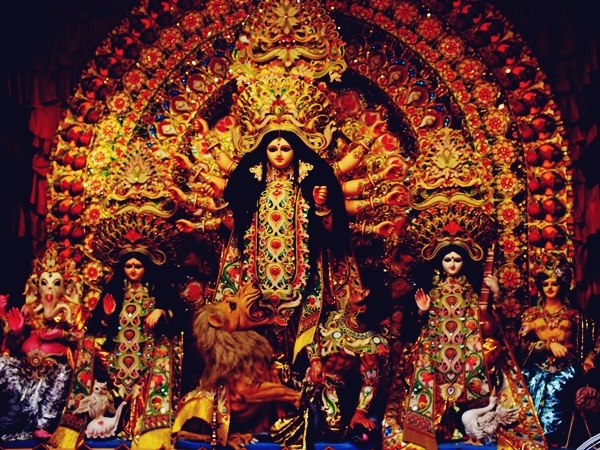 The main puja goes on for three days; Maha Saptami, Maha Ashtami and Maha Navami. On this day Goddess Durga arrives to the mortal world from her heavenly abode, accompanied by her children. She is welcomed with much fanfare amidst the beats of dhak. Unveiling the face of the idol is the main ritual on this day. Kalaparambho, the ritual performed before the commencement of the puja precedes Bodhon, Amontron and Adibas. Saptami is the first day of Durga puja. Kola Bow or Nabapatrika is given a pre-dawn bath. This is an ancient ritual of worshiping nine types of plants. They are together worshiped as a symbol of the goddess. The main Saptami Puja follows Kalparambho and Mahasnan. The day began with a recital of Sanskrit hymns in community puja pandals as thousands of devotees offered anjali to the goddess. Kumari Puja or the worship of little girls as the mother goddess was a special part of the rituals observed in a number of traditional and household pujas. As the day wore on, it was time for the important Sandhi Puja, which marks the inter-linking of the Maha Ashtami and Maha Navami. This is the concluding day of Durga Puja. The main Navami puja begins after the end of Sandhi Puja. The Navami Bhog is offered to the goddess. This is later partaken as prasad by the devotees. After the three days of Puja, in Dashami , in the last day, a tearful farewell is offered to the Goddess. Most of the community pujas postpone the farewell as long as possible and arrange a grand send-off. The images are carried in processions around the locality and finally are immersed in a nearby river or lake. Vijaya Dashami is an event celebrated all over the country.